There are two issues to body transformations, one is, can you get yourself to your goal and then the second is can you maintain it going forwards afterwards? Most weight loss studies are judged by how the person is after five years from starting the plan and usually 4 and half years+ since the actual intervention finished. The results are depressingly bad and show that most people simply revert back to their original or worse state. One of the issues is that regression backwards is slow and subtle yet when this happens over many years you end up in the same or worse state to where you were. A way to prevent this is to implement an annual plan that rotates through many of the methods you used to get to the goal in the first place. If this is done alongside other methods shown to aid maintenance of results then you can be confident of maintaining results. There is a fallacy in health and fitness world that you get to your goal weight or clothes items then you are done, you sail off into the distance and enjoy all that life brings. This is not quite how the real world works. So what does happen when you get to your goal? Modern life presents a sustained challenge on your weight, this happens to you now wherever your body is today and still would happen when at your goal. Despite this, the majority of people spend most of the year breaking even fairly effortlessly. However, there are periods such as holidays (Christmas, Easter, your summer holiday etc) or a particularly stressful period (work deadlines, party season, relationship struggles etc) where you may gain a little body fat. This is fine and fairly natural part of life. The antidote is simply to counter that with an equivalent period of losing body fat, e.g. if you eat plenty of food during the last two weeks of December due to Christmas the simple response is to take a couple of weeks to drop any body fat gained in early January. So once you reach your goal body weight it is not about thinking you will never need to lose body fat ever again but rather that you will need to return to the protocol you know that works to lose any accumulated body fat each year. For most this is just a few weeks per year but the more bad weeks you have the more times you will need to drop into a fat loss protocol to counter the consequences. The way to ensure this happens is to use some sort of an annual plan to focus efforts. Ideally the plan would include connection challenges and other key elements to train the brain which is helpful in countering the negative influences of modern life upon our health behaviours. When this happens you should be easily able to guard against significant weight fluctuations. One problem in weight maintenance is that once your goal is achieved you lose mental focus. To counter this it is often beneficial to develop a new goal to which you can direct action and focus. The most logical approach would be to put your efforts to maximising your health or training for a sport. This is a good practice to adopt as maintaining your current goal weight is part of that process. It is even more helpful if the new approach involves being around other people of similar mindsets as such group thinking will influence you positively. If you do not find a new focus then people often just move their goal posts and now focus on being even ‘thinner’ and look to lose more weight. I find this to be negative and a cause of negative body image issues. It is very powerful to have a end goal for your weight and when you get there then declare yourself done and feel happy about yourself and what you have achieved. It is in this place a new sports or focus on health becomes a healthy way to direct your mind. 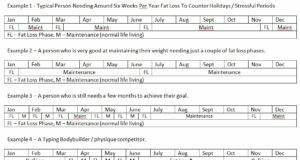 There are two elements to the annual plan, one is structuring of the annual for periods of fat loss to counter any increase in weight that may happen through holidays, stressful periods or planned weight gain. The second element is using different challenge and focuses to maintain your standards in health & fitness so you can effortlessly without thinking stay around your goal target. This can be further improved through the use of advanced health protocol and focusing on sports as mentioned previously. Photo – Some example annual plan structures.